In a thoroughly stunning development, the FBI has announced the relaunch of an investigation into Hillary Clinton’s emails and personal server, after learning of “the existence of emails that appear to be pertinent to the investigation,” as Rep. Jason Chaffetz tweeted this afternoon. With just ten days to go before the presidential election, this development could knock the Clinton campaign for quite the loop — particularly amid growing controversy in revelations from campaign chair John Podesta’s emails, which continue to be published by Wikileaks on a daily basis. 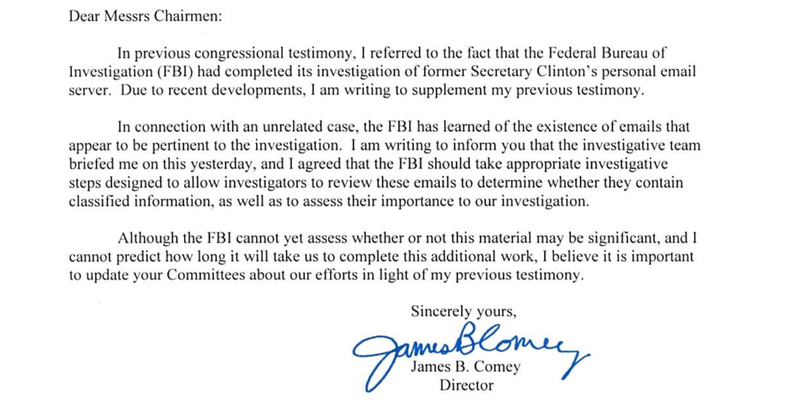 Comey made no suggestion whether or not the documents could be “significant,” but the fact the investigation has now been reopened certainly piques additional questions about both the new items as well as how they might have originally escaped the FBI’s attention. “There are outstanding questions . . . regarding a possible conflict of interest into this case,” stated House Oversight Committee Chairman Jason Chaffetz in a letter to FBI Deputy Director Andrew McCabe, as cited by the Washington Post. Chaffetz requested McCabe provide documentation concerning his wife’s 2015 bid for the Senate, which, as the Post notes, received financial support from Virginia Gov. Terry McAuliffe, who is close to Hillary Clinton. Considering the increasingly embattled campaign of Hillary Clinton, and the late date for initiating further investigation, one wonders whether the abrupt discovery could be related to the putatively missing 30,000 emails which have been the subject of both consternation and ridicule for months. Although Comey did not reveal, well, much of anything about the decision to relaunch the investigation, it’s clear this will have a direct and resounding impact on Hillary Clinton’s contentious bid for the White House.